A Sydney man has trekked 900km across India – warding off fatigue, dehydration and a stray King Cobra snake – to draw attention to depression and anxiety and raise important funds for beyondblue. 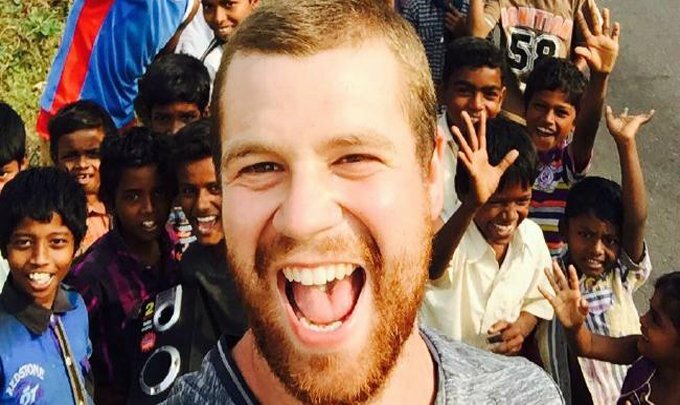 Former Big Brother housemate Tom Mackay, 28, has just returned to Australia after completing an epic journey from Bekal, on India’s west coast, to the Bay of Bengal along the east coast. Tom completed the solo walk in less than two months (January 15 – February 24), pulling a cart holding his possessions and camping gear, with which he set up camp along the route most nights. So far he has raised more than $12,000 for beyondblue, and hopes to reach $50,000 this year. Tom, who was a Big Brother housemate in the 2014 season, was motivated to support beyondblue as he knows first-hand how debilitating a mental health issue can be. “At times I’ve really struggled with anxiety. While on the surface it may have seemed like I was a bubbly guy with a great life, I had a constant feeling of worry. I started hitting the bottle big time on the weekends to escape it,” he said. Throughout his walk, Tom kept a blog detailing funny and touching stories from the road (www.walkingthewalk.com.au), including recounts of the hospitality he received from locals he met. “There were the challenges of fatigue, dehydration and the occasional suspicious dog, but none was greater than coming face to face with a King Cobra as I was setting up camp one night. I’m petrified of snakes so had to give myself ‘ten in the bin’ – a few minutes to cool down – before I was back on track. beyondblue CEO Georgie Harman said the organisation is very grateful to Tom for helping support the millions of Australians experiencing depression and anxiety and their families. “Tom not only dedicated two months of his life to a meaningful pilgrimage in support of beyondblue, he has shared his own experience of anxiety to break down stigma associated with this and other mental health conditions,” she said. “Tackling stigma paves the way for more people to seek support when they need it. This is very important because untreated mental illness is a major risk factor for suicide. Tragically, more than 2,800 Australians took their lives in 2014 alone. “The funds Tom has raised will help beyondblue continue its life-saving work, including offering the free beyondblue Support Service which is available 24/7 by phone on 1300 22 4636 or via www.beyondblue.org.au/get-support for live web chat (3PM-midnight AEDT) or email responses. People can donate to beyondblue through Tom’s journey on his My Cause page, which is linked on his website www.walkingthewalk.com.au and Facebook www.facebook.com/walkingthewalk11.